Tethys Petroleum has announced that AKK17, the first shallow gas exploration well of its 2014 programme has been successful. Analysis of data from the well indicates it to be similar to the AKK15 well which tested gas at a stable rate of approx. 7 million cubic feet (195,000 cubic metres or 1,167 barrels oil equivalent) per day, and the AKK17 appears likely to test at a comparable rate. The AKK17 well, drilled to a depth of 653 metres (2,142 feet) some 2.2 kms (1.4 miles) NE of the AKK15 well, encountered a 4 metre (13.1 feet) interval of gas bearing Tasaran sand with an average porosity of 31%. This compares to the AKK15 well which also encountered a 4 metre (13.1 feet) gas-bearing interval of similar quality, and which will be tied in as part of this years programme. The AKK17 well will be flowed as part of a testing programme to be carried out after further wells have been drilled. The drilling rig has now been mobilised to the second shallow gas exploration well location, AKK18, and drilling should commence within the next week. 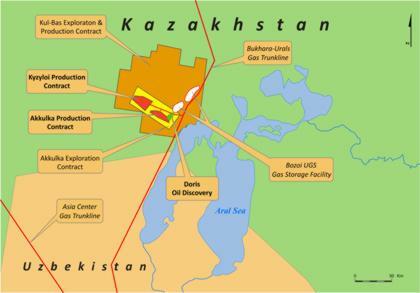 On other operations and production levels in Kazakhstan: Oil production from the Doris field is currently at approx. 3,000 barrels of oil per day with the mechanical issues relating to well pumps having now been resolved and the recent adverse weather conditions having improved. Further work is planned this year to increase oil production including horizontal drilling and bringing on stream the Dione oilfield.